Oriental Orthodoxy is the communion of Eastern Christian Churches that recognize only three ecumenical councils — the First Council of Nicaea, the First Council of Constantinople and the Council of Ephesus. They reject the dogmatic definitions of the Council of Chalcedon. Hence, these Churches are also called Old Oriental Churches or Non-Chalcedonian Churches. The history of all Oriental Orthodox Churches goes back to the very beginnings of Christianity. They were founded by the apostles or by their earliest disciples and their theology did not undergo any significant change in the course of their history. The Oriental Orthodox Churches had a great missionary role during the early stages of Christianity and played a great role in the history of Egypt. According to the canons of the Oriental Orthodox Churches, the four bishops of Rome, Alexandria, Ephesus (later transferred to Constantinople) and Antioch were all given status as Patriarchs; in other words, the ancient apostolic centres of Christianity, by the First Council of Nicaea (predating the schism) — each of the four patriarchs was responsible for those bishops and churches within his own area of the Universal Church, (with the exception of the Patriarch of Jerusalem, who was independent of the rest). Thus, the Bishop of Rome has always been held by the others to be fully sovereign within his own area, as well as "First-Among-Equals", due to the traditional belief that the Apostles Saint Peter and Saint Paul were martyred in Rome. The schism between Oriental Orthodoxy and the rest of the Church occurred in the 5th century. The separation resulted in part from the refusal of Pope Dioscorus, the Patriarch of Alexandria, to accept the Christological dogmas promulgated by the Council of Chalcedon, which held that Jesus has two natures: one divine and one human. 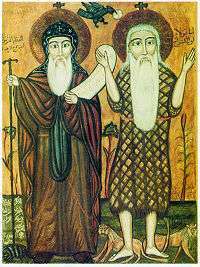 This was not because Chalcedon stated that Christ has two natures, but because the council's declaration did not confess the two natures as inseparable and united. Pope Dioscorus would accept only "of or from two natures" but not "in two natures." To the hierarchs who would lead the Oriental Orthodox, this was tantamount to accepting Nestorianism, which expressed itself in a terminology incompatible with their understanding of Christology. Founded in the Alexandrine School of Theology it advocated a formula stressing the unity of the Incarnation over all other considerations. The Oriental Orthodox churches were therefore often called Monophysite, although they reject this label, as it is associated with Eutychian Monophysitism; they prefer the term "non-Chalcedonian" or "Miaphysite" churches. Oriental Orthodox Churches reject what they consider to be the heretical Monophysite teachings of Eutyches and of Nestorius as well as the Dyophysite definition of the Council of Chalcedon. Christology, although important, was not the only reason for the Alexandrian Church's refusal of the Council of Chalcedon; political, ecclesiastical and imperial issues were hotly debated during that period. In the years following Chalcedon the patriarchs of Constantinople remained in communion with the non-Chalcedonian patriarchs of Alexandria, Antioch, Jerusalem, while Rome remained out of communion with them, and in unstable communion with Constantinople. It was not until 518 that the new Byzantine Emperor, Justin I (who accepted Chalcedon), demanded that the Church in the Roman Empire accept the Council's decisions. Justin ordered the replacement of all non-Chalcedonian bishops, including the patriarchs of Antioch and Alexandria. The extent of the influence of the Bishop of Rome in this has been a matter of debate. The reason for the excommunication of the non-Chalcedonian bishops by the Bishops of Rome and Constantinople in 451, that formalized the schism, was the teaching that Jesus Christ has two natures, which the Council of Chalcedon upheld as a dogma. One of the most salient features of the history of Oriental Orthodoxy has been the ceaseless persecution and massacres suffered under Byzantine, Persian, Muslim and Ottoman powers. The Oriental Orthodox communion comprises six groups: Coptic Orthodox, Syriac Orthodox, Ethiopian Orthodox, Eritrean Orthodox, Malankara Orthodox Syrian Church (India) and Armenian Apostolic churches. These six churches, while being in communion with each other are completely independent hierarchically and have no equivalent of the Bishop of Rome or Ecumenical Patriarch of Constantinople,  with no concepts of supremacy or precedence respectively. By the 20th century the Chalcedonian schism was not seen with the same relevance, and from several meetings between the authorities of Roman Catholicism and the Oriental Orthodoxy, reconciling declarations emerged in the common statement of the Oriental Patriarch (Mar Ignatius Zakka I Iwas) and the Pope (John Paul II) in 1984. This article is issued from Wikipedia - version of the 8/14/2014. The text is available under the Creative Commons Attribution/Share Alike but additional terms may apply for the media files.